Another star power outage hit ABC Thursday morning. Dancing with the Stars, amid the usual over-the-top hoopla on Good Morning America, announced the hoofers and puffers for its 19th edition. And it may be tough for the show’s dwindling fan base to get excited when the biggest brand name is super-inhaler Tommy Chong. Whether or not his lungs are shot, Chong will be partnered with pro dancer Peta Murgatroyd when DWTS resumes on Monday, Sept. 15th with a two-hour floor show. 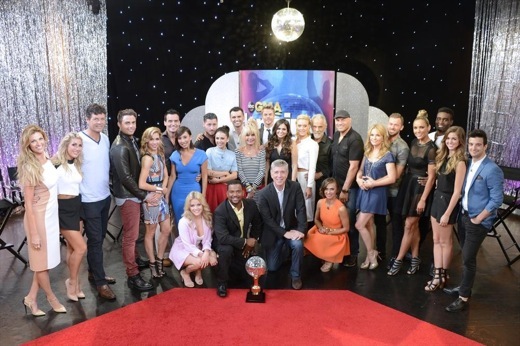 The first two weeks will have elimination Tuesdays before DWTS settles back into last season’s pattern of one Monday outing per week with same-night eliminations. Here are the dozen other people joining DWTS, which as previously announced is adding veteran dance professional Julianne Hough to its judging panel. Charter judges Len Goodman, Carrie Ann Inaba and Bruno Tonioli are all returning. Your hosts are Tom Bergeron and Erin Andrews. ***ABC also has announced that Rosie Perez and Nicolle Wallace will round out the revamped panel of The View when its new season launches on Monday, Sept. 15th. Whoopi Goldberg is the only holdover, with former View fire-starter Rosie O’Donnell returning after a stormy exit in 2007.